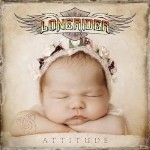 Share the post "Album review: LONERIDER – Attitude"
Lonerider is a new band featuring some experienced names that sees FM vocalist Steve Overland team-up again with guitarist Steve Morris (they both recorded together under the Heartland name) and Bad Company drummer Simon Kirke (who played with Steve and his brother Chris’s first band Wildlife back in the early 80’s). Thunder and Tyketto bassist Chris Childs and Brian J Anthony (acoustic guitars, mandolin, percussion) complete the line-up. The blues rocker ‘Last Train’ features some wonderful slide guitar playing from Steve Morris, whilst the reflective ‘Yesterday’s Heroes’ is a classic FM flavoured tune. I am not sure lyrically if this is Steve Overland singing about his own brother Chris, who was with him in Wildlife and the early days of FM, before leaving the rock ‘n’ roll limelight. The second half of the album has a distinct Bad Company feel, none more so than ‘Rock N Roll Dreamer’ which sounds like an update of Bad Company’s classic ‘Shooting Star’. ‘Rhythm Of Life’ is another Bad Company themed rocker, with Steve Overland on fine form. Of course having Simon Kirke’s rock steady beat underpinning the songs adds to the Bad Company style sound. Lonerider have made an album full of blues rock/hard rock delights, which not surprisingly draws heavily on the sounds of FM and Bad Company. They can’t help but sound like these bands, especially given Steve Overland’s distinctive vocals, however they channel their own sound at times, for example on ‘Hard Habit To Break’. This entry was posted in ALBUM REVIEWS, ALBUM REVIEWS (Mobile), All Posts and tagged album, Attitude, blues rock, classic rock, Escape Music, FM. Bad Company, melodic rock, review, Simon Kirke, Steve Overland. Bookmark the permalink.